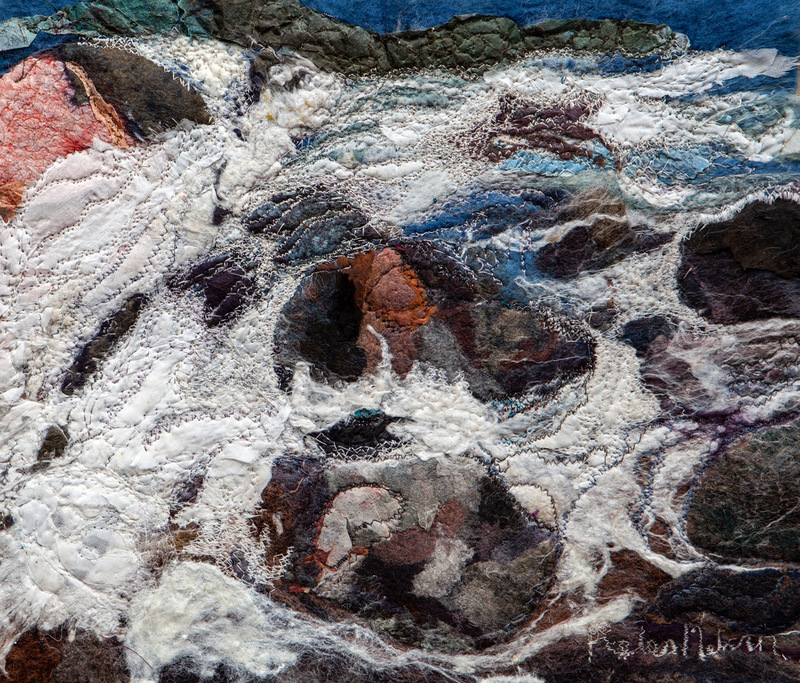 River in Spate is a Helen Melvin original landscape in naturally dyed felt, fabric and paper and machine stitch. The River in Spate is an unique Helen Melvin Landscape made with a method of wet felting developed over twenty years five and combines pure fine merino wool fibres with silk fabric and fibres to create movement and texture. On top of this layers of felt, fabric and papers are added with stitch or stitch alone which is also used to emphasise movement as well as the power of water. The inspiration for this picture comes from the many rivers seen in flood in the North Wales where I live particularly in the wet winters. But as well as the power of nature seen in water pounding over and around the rocks the force of water speaks to me in may different ways. It reflects how nature impacts on us as well as representing turmoil and chaos that can result from climate change. Creating my landscapes is a way of creating beauty from something that can also seen as a menace and something to fear.